As I slog through what is turning out to be the longest winter of my life, my mind keeps returning to one thing over and over: Peace House. Any free moment my brain has, it begins to daydream about projects I can start this year. The lower deck doesn't get directly light and is an unused space. There's a picnic table there that is clearly never used. 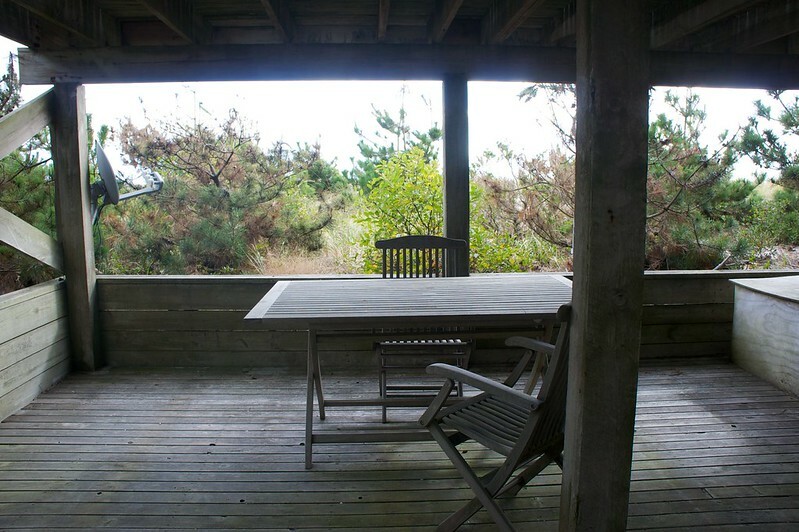 I mentioned it to a friend and he said that he went to a place in the Pines with the exact same situation - a nice upper deck with a lower deck that didn't get direct sun. He said that you eventually want to get out of the sun on hot days and the house he stayed at had a nice lounge space on the lower deck for reading and being outside without being in the direct sun. That makes sense to me, so I'm trying to figure out a way to make that a nice hang-out. Which leads to one of the renovation possibilities: HOT TUB! I've got my eye on a nice cedar hot tub or a Japanese-style ofuro. I watched some videos on assembling a cedar tub. It turns out that it's really easy. They send you the wood, you piece it together, tighten some metal bands, and fill it with water for 24 hours. The cedar expands once it is filled with water and becomes water-tight. I've also thought it would be nice to mix that with either a hammock or a couple of wide benches with outdoor pillows. Something like the following, but not made from pallets and a bit more downscale (and outside, OBVS!). Ideally, I'd like to make the benches myself. It wouldn't require any great carpentry skills to make something slightly nicer than a pallet. I've found some lumber yards in Brooklyn and New Jersey that have reclaimed wood for sale. I think I could cut all the wood in the basement and drill all the holes, drag all the wood to Cherry Grove, and then assemble it on site. And I'd end up with a really nice custom lounge area. I found a great site that has plans, shopping lists, cut lists, and instructions for all sorts of basic furniture around the house. I found the following plan for a double-wide lounger that could be made to fit the lower deck. My dream would be to come up with a plan in which the loungers incorporate the hot tub so it all just sort of fits together. 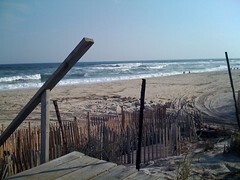 But that will have to wait for me to get out to Fire Island, measure, and plan something on paper. So I will continue to wait for the winter to be over so I can get out there. The past two years, I've rented a place on Fire Island for a week - specifically, in Cherry Grove. Previously, I had taken the pups out, got a 2 bedroom unit, and attempted to get work or writing done.